Damon Keuhl and I have had some good fly fishing adventures together over the past few years when he's in town vacationing at Figure Eight Island. Today would prove to be no different... Our morning of fishing was completely shut out by inclement weather, mostly rainfall and wind. We were patient, let the weather pass through and decided to fish the afternoon rising tide in search of tailing redfish. While running towards the first flat Damon and I encountered a huge school of marauding Jacks, Ladyfish and Bluefish wrecking finger mullet. There were literally explosions from the fray surrounding us as we poled into range. It was hard to concentrate on where to steer Damon with so much activity. I immediately tied on Vernon's Habanero Poppers for Damon to get some topwater eats/action and we literally had success from the first cast to the last cast. 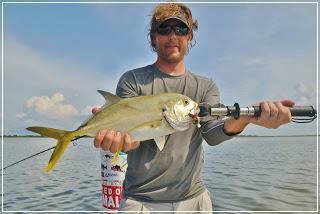 Damon must have hooked a dozen jacks, blues and ladyfish with several more slashing at the fly but completely missing! 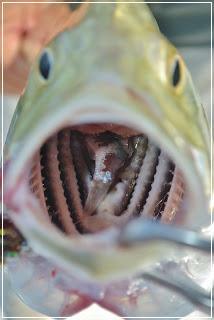 The tide played out and the Jacks and ladyfish shut down with the change. 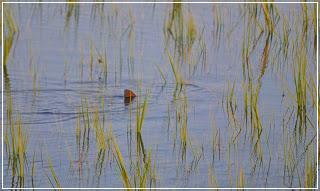 We moved closer to the flooded grass along with the redfish and set up to wait on the tide to fill the grass. 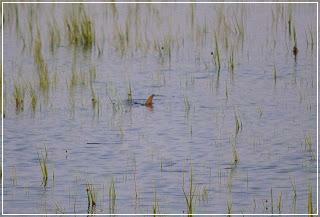 Not five minutes of waiting and Damon spotted his first ever tailing redfish waving silently in the middle of a small pond. It was still early in the tide and while we launched a full scale attack on foot the fish ghosted away and was swallowed by the rapidly advancing tide. Hustling back to the boat we began hunting the now flooded glades of grass spotting tailing reds every fifty feet of ground we covered poling the skiff. Some fish were active, some spooky and a few Damon hit right on the head with the fly...Jitters. The jitters didn't last long... I poled us up on another flat and immediately two tails turned into three and in the distance we spotted four more. It was on fire. Casting to the tailing fish closest to us Damon got a viscious eat from a scrappy five pounder. 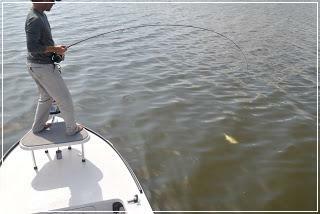 Fly line peeling off and drag singing, Damon had just caught his first tailing redfish. We high fived, took some photos and released the fish quickly and got back in the game chasing more fish. We must have seen another ten or eleven tailing fish and then it happened. We spotted a stud happily waiving his tail above the water. Damon executed a great cast and the fish pounced. We had to chase this one down as he was threatening to peel some backing. I tailed the fish and realized just how big this one was. 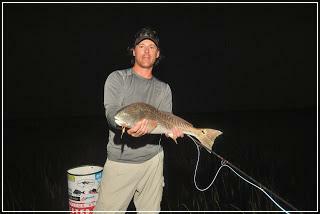 Damon's second fish in the grass would be his biggest, nine pounds of red drum from the grass. It was an epic afternoon and a great adventure as usual with Damon. Can't wait until next year. There's plenty of action happening on the Cape Fear Coast. Get in on the action. Try our new reservation booking service on the site and book your charter today!